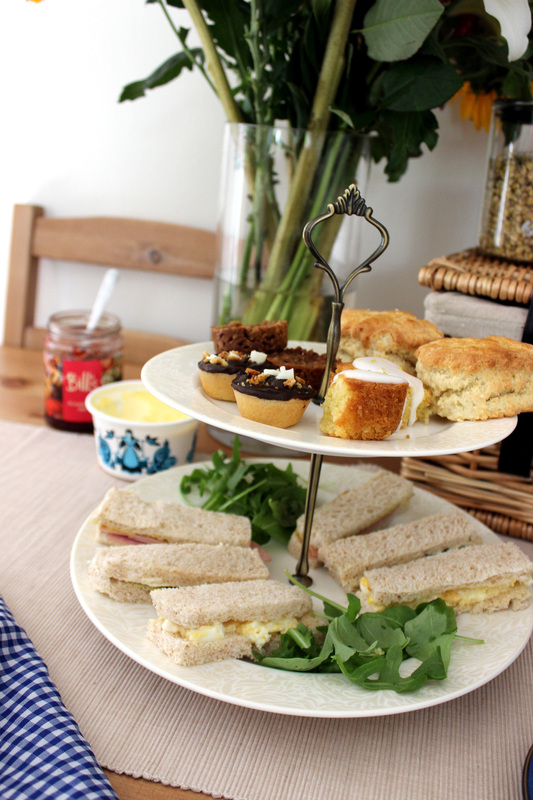 I’m a big Afternoon tea fan, so much so it even has it’s own section on my blog! 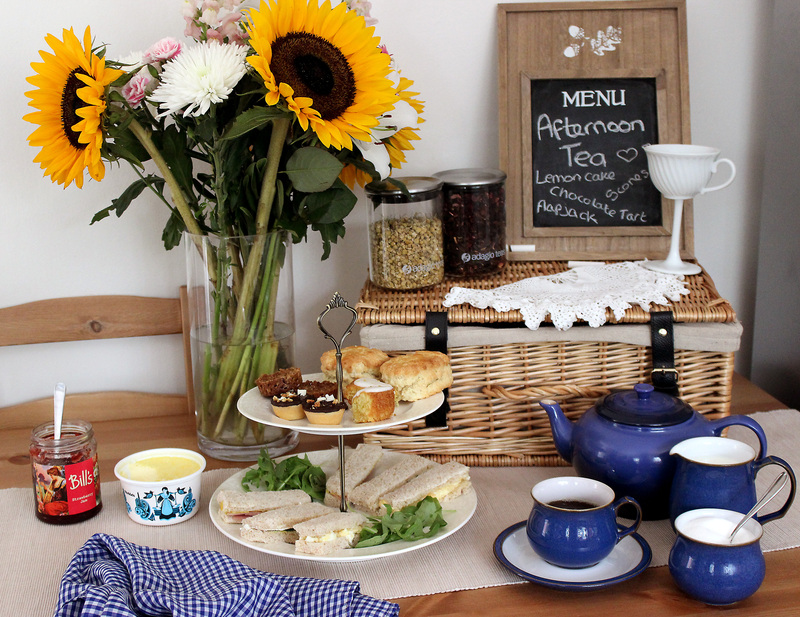 I’ve been wanting to put together a tutorial for a DIY Afternoon Tea for ages and as it’s Afternoon Tea Week I thought now would be the perfect time to get baking and show you just how easy it is to create your very own version at home. 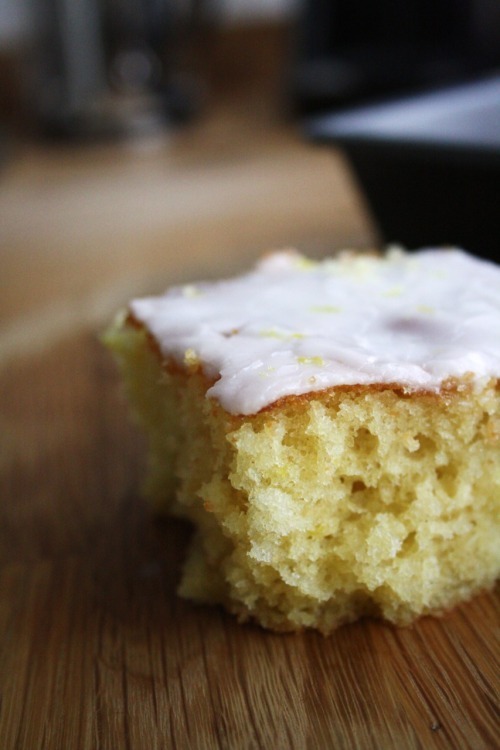 It’s not as fiddly or as time consuming as you might think with my super simple cake recipes suitable for all levels of bakers and sandwiches with stuff you’ve already got in your fridge. 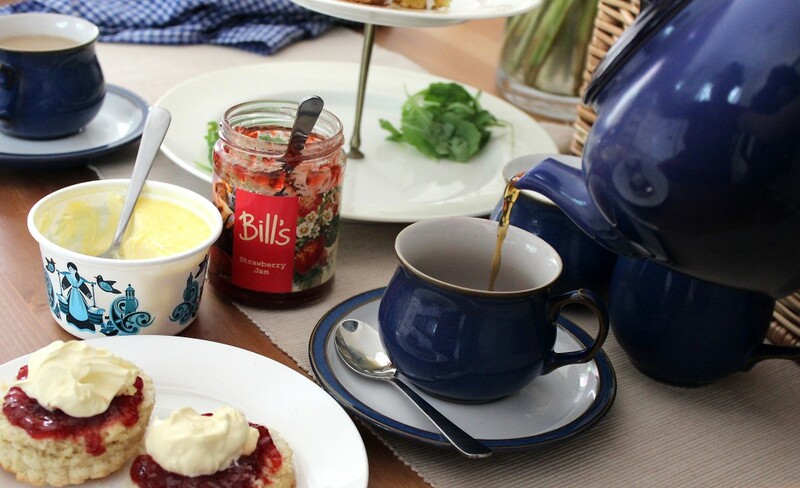 There’s never been a better excuse to dust off that teapot and get your favourite people round for a giant scone and a few finger sandwiches! 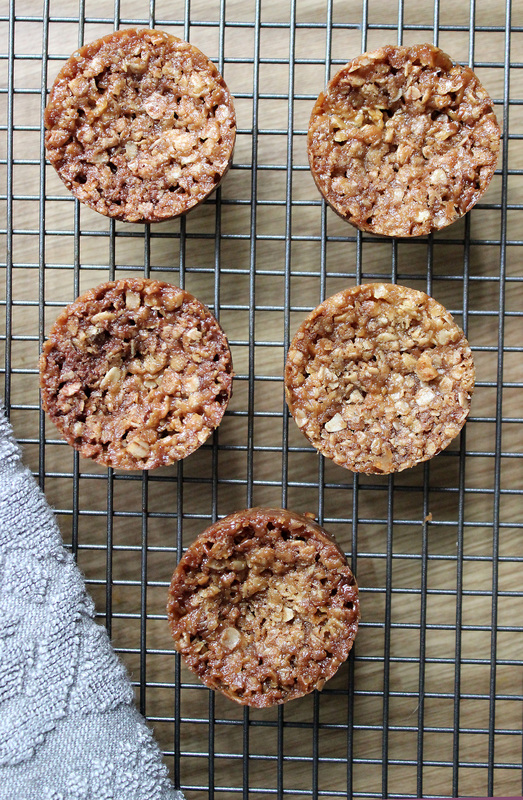 I took my original Honeycomb Flapjack Recipe and pressed the mixture into a miniature muffin tin to create bite-sized flapjacks and I also left off the chocolate to help speed up setting time as I made them just before my guests arrived. By throwing in a few more chocolate chips you still get that chocolatey hit from my original recipe but these bad boys are ready to eat within the hour! 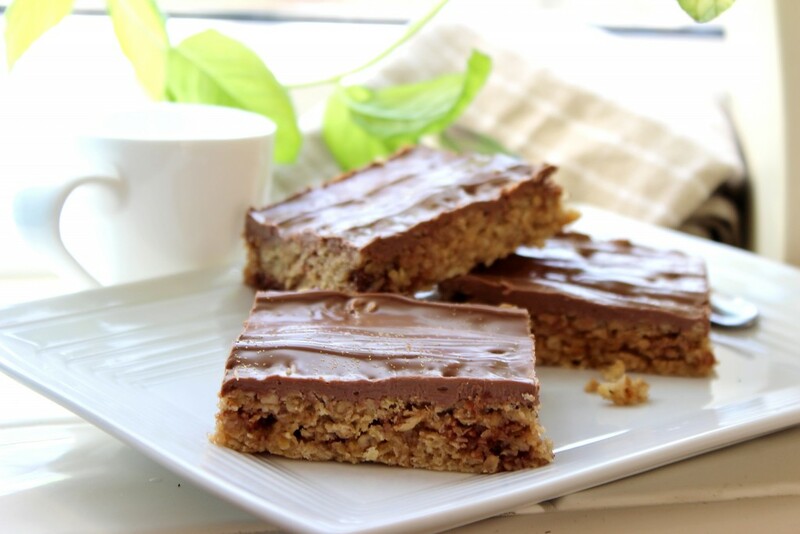 You could always drizzle a little chocolate over the top if you’ve got a bit more time which wouldn’t take as long to harden as a full thick layer of creamy chocolate! I whipped up one of my signature and super easy cakes – The Iced Lemon Traybake and cut that into bite-sized squares for the top layer and of course warmed up two Scones from my Perfect Scone Recipe last week…deelish! Emily from Recipes and Reviews was my Afternoon Tea guest and brought round some adorable (and also super easy) Chocolate Tarts to finish off our cake layer! 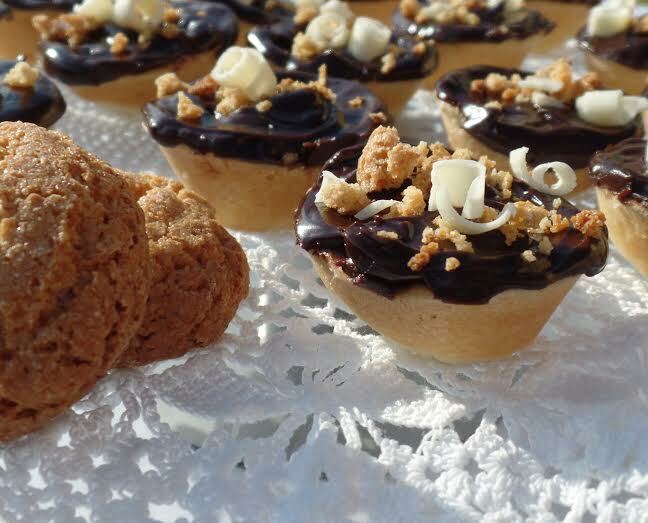 They looked perfect giving us a much needed choccie kick alongside the jam, oats and lemon – something for everyone! 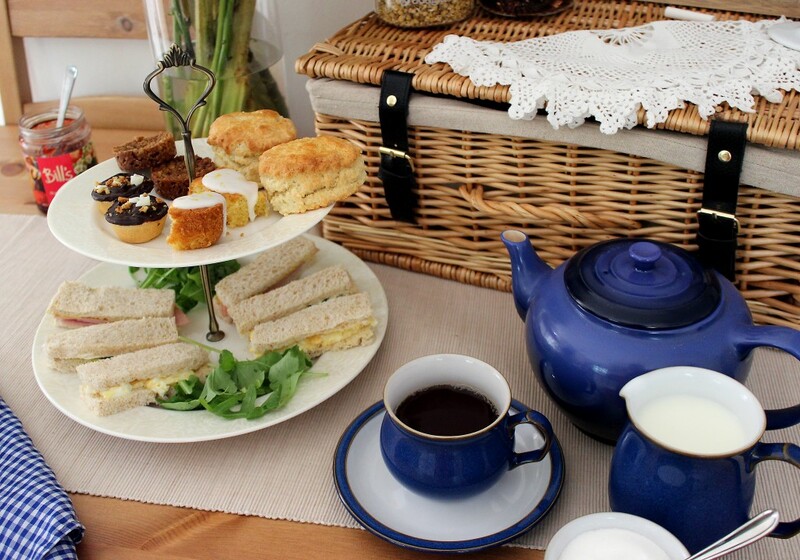 Why not ask your guests to each bring a cake for the top layer of your DIY Afternoon Tea?! You could even judge each other Great British Bake Off stylee and give out a little present for the winner! For your savoury layer you can be as creative as you like! 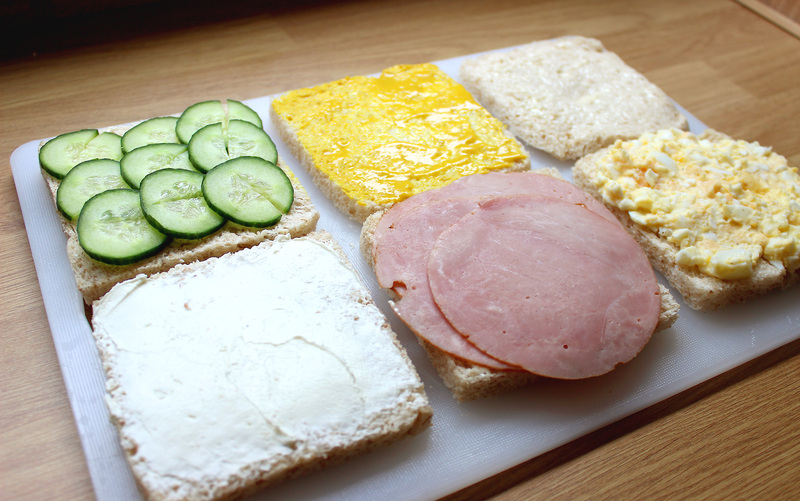 I made three different sandwiches from ingredients I had in my fridge – Cream Cheese and Cucumber, Honey Roast Ham and English Mustard and Fresh Egg Mayonnaise. I bought a Kingsmill 50/50 crustless loaf (what a time saver!) and buttered up 6 slices with the good stuff – no low fat spread here thank you – before dolloping on a generous layer of filling and slicing into three fingers. My Egg mayonnaise was simply three eggs hard boiled and mashed with Heinz Mayonnaise and a little Salt n’ Pepper – delicious and so much better than the pre-made stuff! 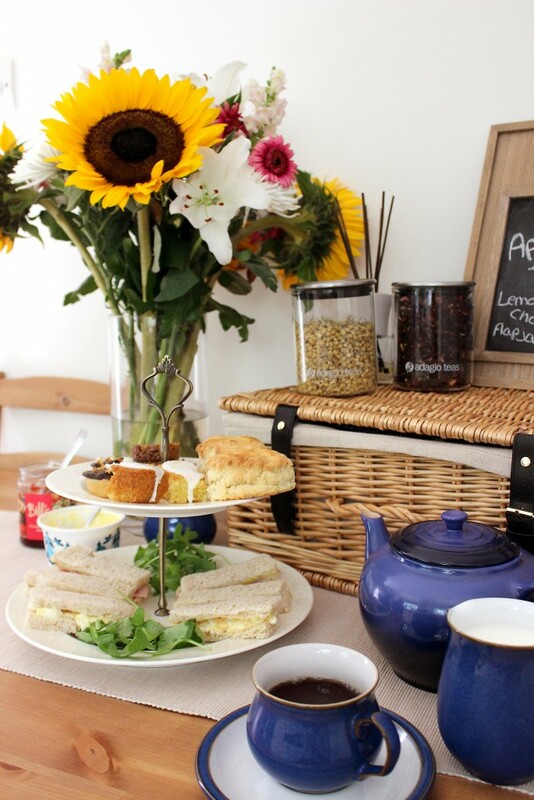 Remember to ask ahead to see if any of your guests are vegetarian/vegan or has any allergies so you can adjust the sandwich fillings and make sure no-one goes hungry! You can pick up a pretty cake stand from anywhere with a modern or more traditional feel. I have the Monsoon Lucille Gold Cake Stand from Denby that mum bought me one Christmas and I absolutely love it – it’s so dainty and has beautiful matte gold leaf patterns around the rim. 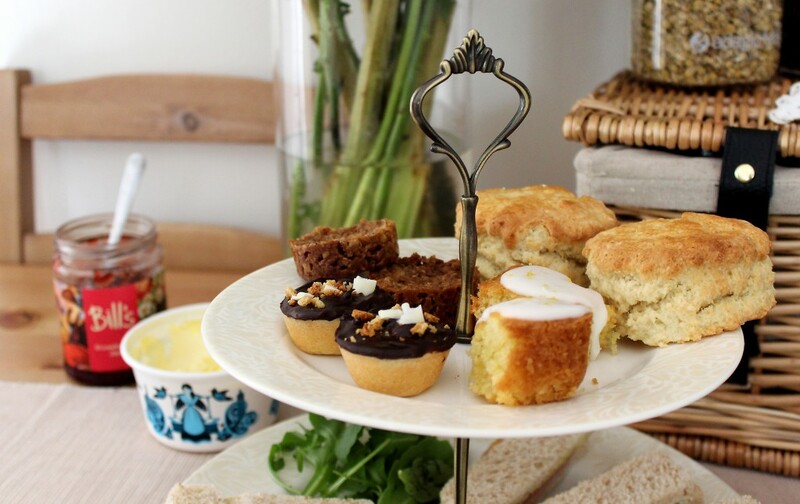 Cake stands don’t have to be expensive – you can find them at a local car-boot sale or online second hand, they don’t even have to match your crockery – the more eclectic the better with a DIY Afternoon Tea! 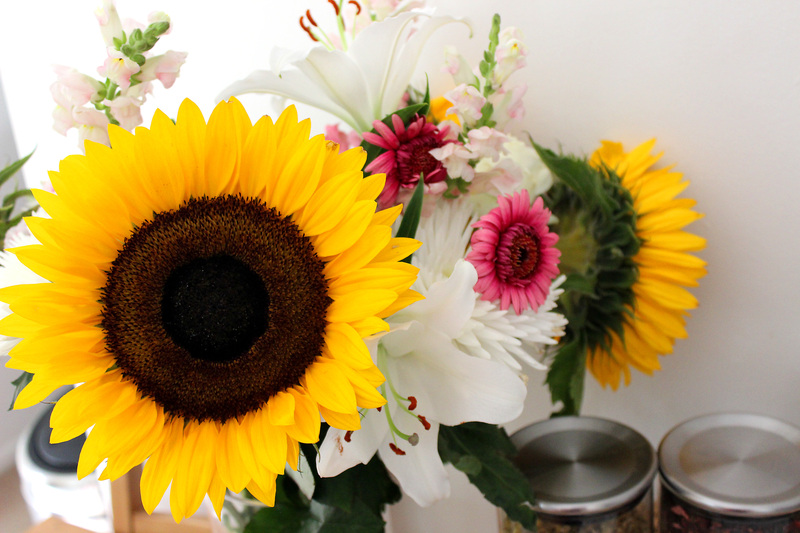 Fresh flowers always make a table look happier! I have a tea box that a friend bought me for Christmas for one year which was such a cute little addition to my DIY Afternoon Tea! 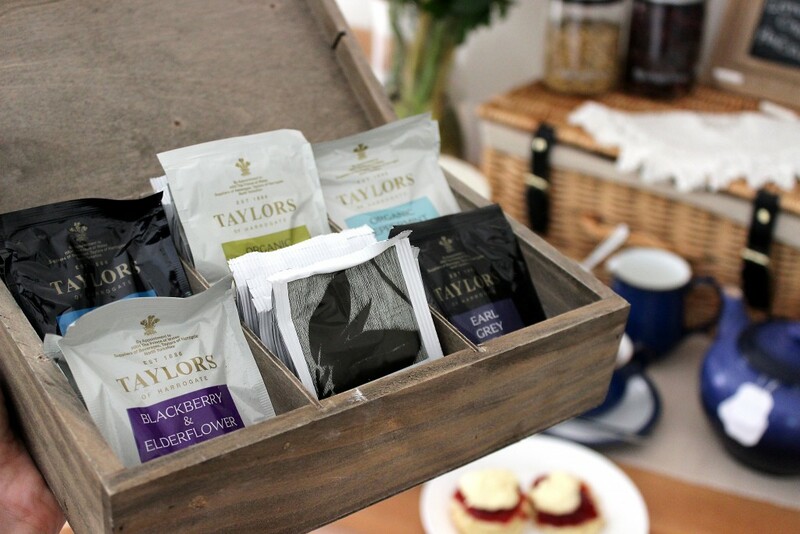 Fill it with individual packets of your favourite teas and give your guests a choice! Don’t neglect the classics though, it’s Earl Grey and English Breakfast for me! 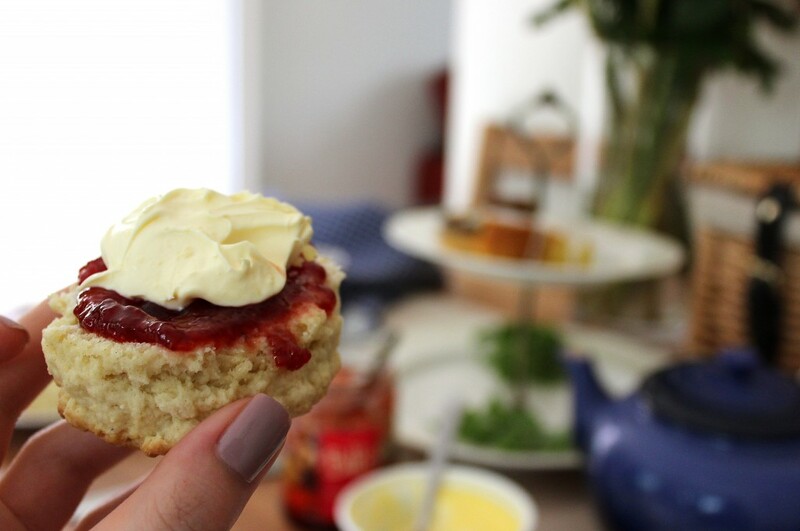 Cream or Jam first…that is the question! 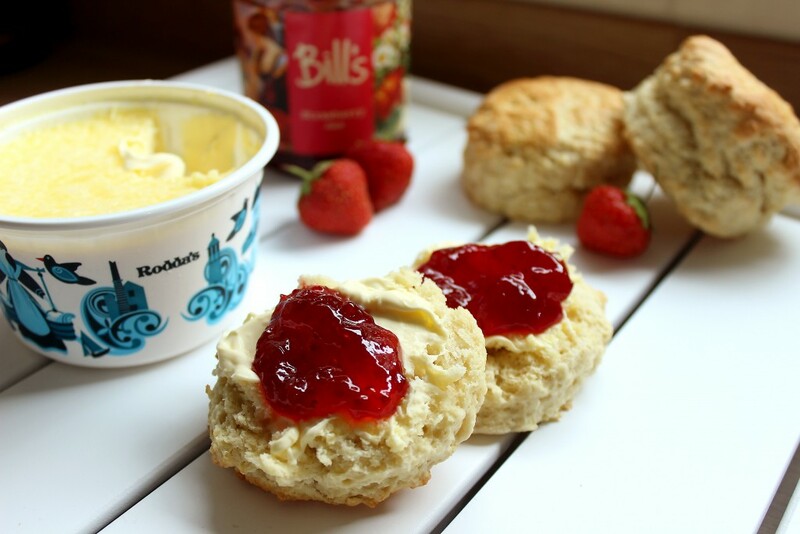 Don’t forget your clotted cream and jam for the scones – my favourites are Rodda’s Clotted Cream which you can find in your local supermarket and Bill’s Strawberry Jam which you can get online, they’re so yummy! 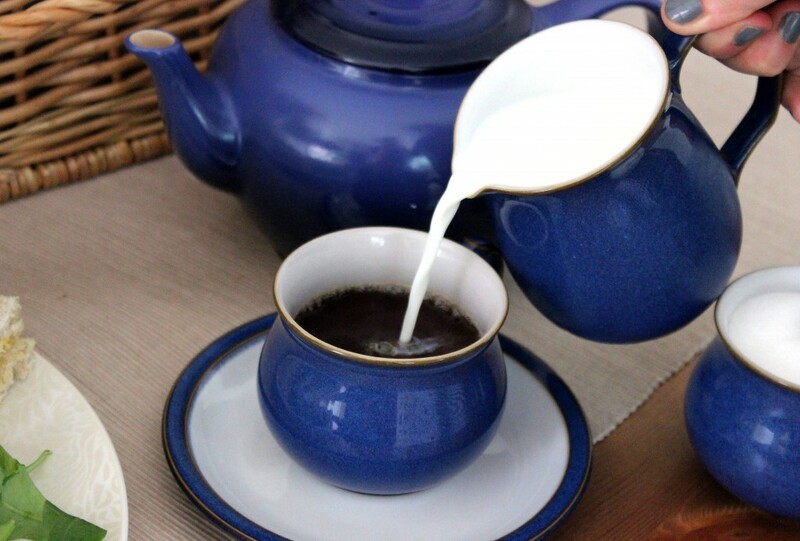 Make sure you have enough milk and sugar for your tea too. 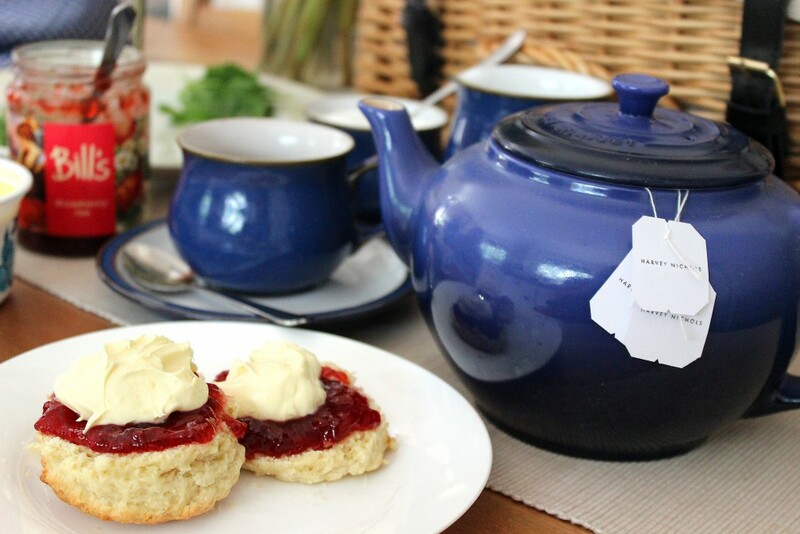 I borrowed a Le Creuset Teapot for my DIY Afternoon Tea because I don’t actually own one myself – call myself a tea lover ey! I’ve matched it with these beautiful (also borrowed!) Denby Imperial Blue Teacups and Saucers and I think they go beautifully. 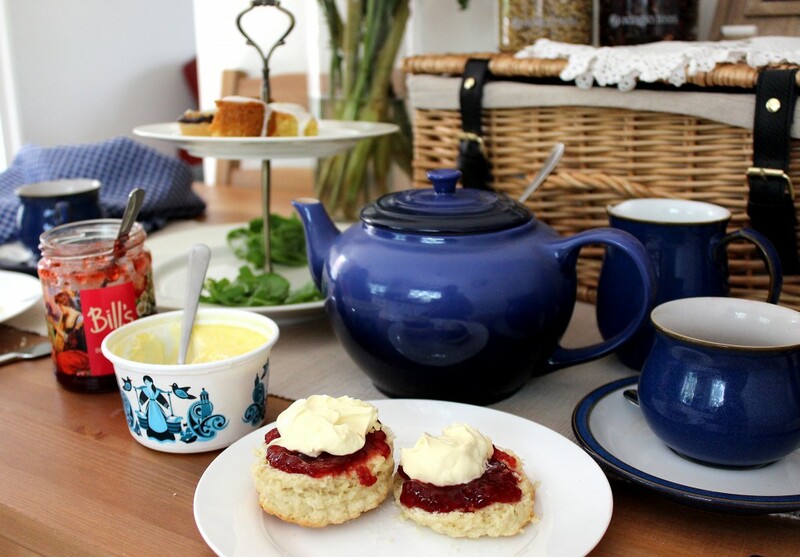 I think for my next DIY Afternoon Tea I must invest in the matching Denby Lucille Teapot and Teacups so my cake stand doesn’t feel left out…it’s definitely a necessary purchase, honest. You can make your flapjacks and chocolate tarts the night before and whip up that deliciously light lemon cake and a batch of scones in 90 mins on the day. Your sandwiches will take you less than 15 minutes and the only other thing you need to do is boil a kettle – easy peasy! There’s always cake leftover at Afternoon Tea so why not pick up some mini cake boxes for your guests to take home the extras they couldn’t manage…that’s if your other half doesn’t get there first! 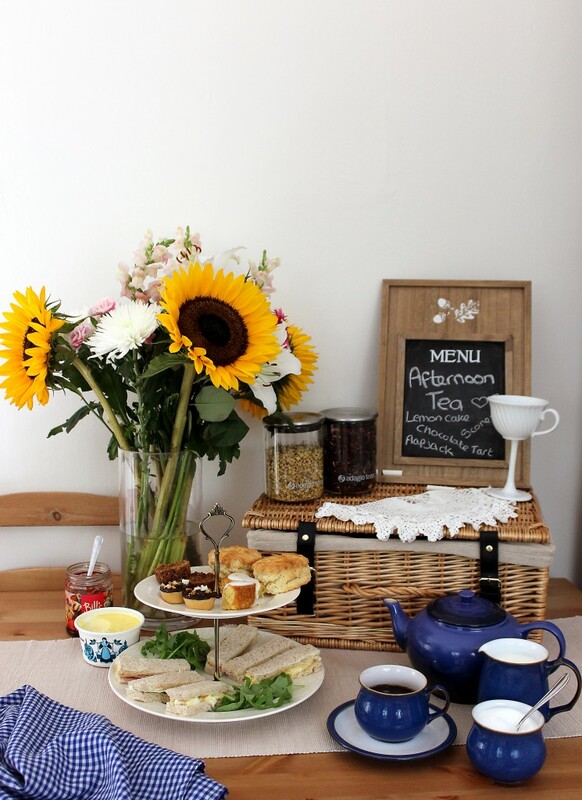 Don’t forget to tweet me a picture @xameliax or tag me on Instagram @xameliax if you give my Easy DIY Afternoon Tea Tutorial a go, and save me a slice of that lemon cake! Which cakes would you have on top of your sweet layer? 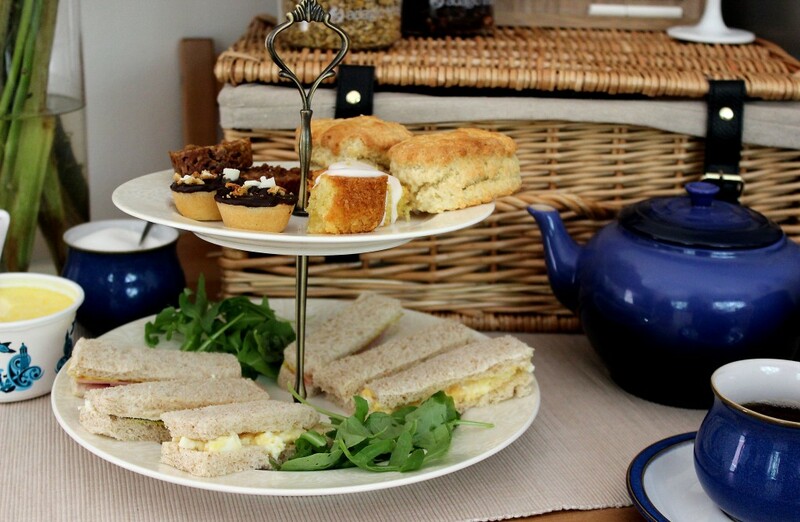 What’s your favourite Afternoon Tea Sandwich Filling? 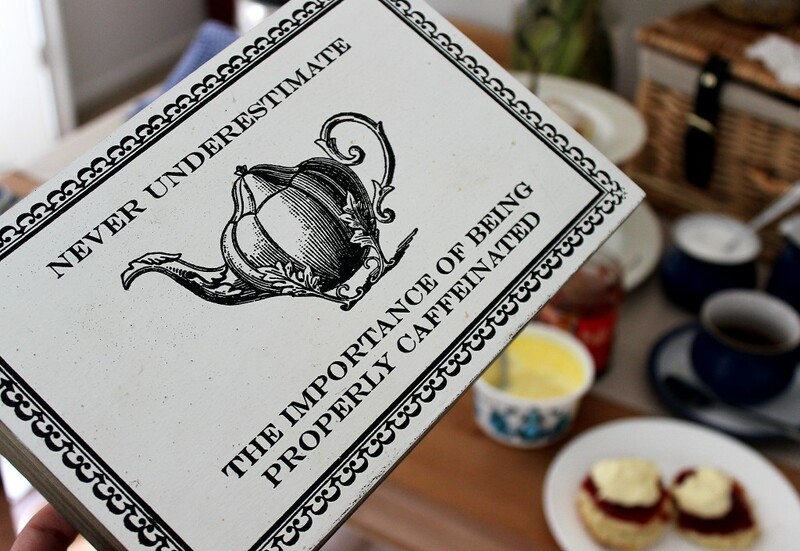 And what’s your tea of choice?